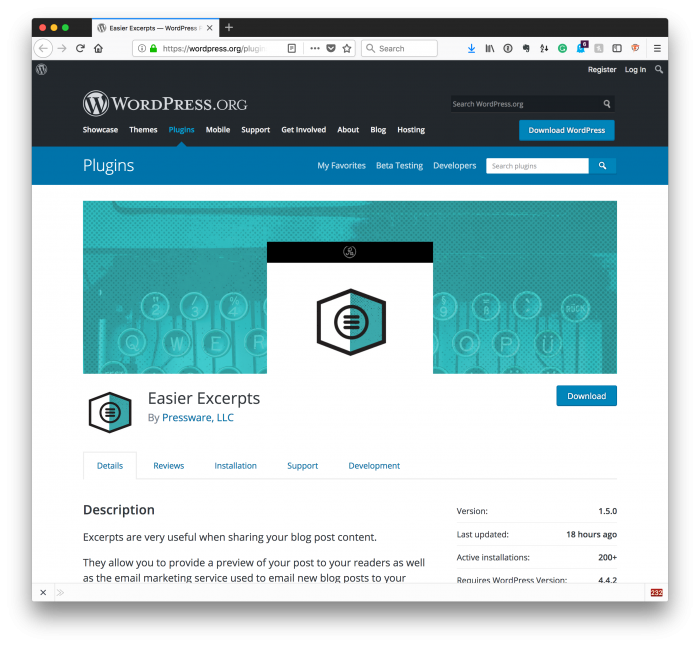 The latest version of the plugin is available in the WordPress Plugin Repository and is compatible with WordPress 4.9.4. You can install it via your WordPress dashboard by searching for “easier excerpts” or, if you already have it installed, it will prompt you to update it as per usual. Furthermore, it will work with any post – new or old – and no data will be affected if you opt to uninstall. Two of the things that are worth noting above is that namespaces have been added as this will eventually be part of the Blogging Plugins suite of tools. Further, I removed the old test suite as I, though I think it’s useful for others from which to learn, I’m changing the way in which I write my tests, so the way the previous test suite was written was no longer relevant. This is something that I plan to cover in an upcoming post. But for now, try out the plugin especially if you’re a regular blogger.